In the days following D-Day in June 1944, Ruth Cowan waited in London along with other women war reporters for the official orders that would permit her to cross the Channel to France. Meanwhile, in the days after D-Day German forces had unleashed on England the VI rocket, or buzz bomb. In an interview with General Dwight D. Eisenhower, the supreme Allied commander, Helen Kirkpatrick commented on the buzz bombing: “It’s too damned dangerous here. I want to go to France.” Eisenhower issued orders for women to be permitted to cross. 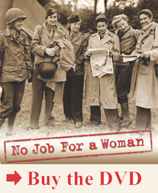 Ruth Cowan is featured in the film “No Job For a Woman”: The Women Who Fought to Report WWII.